Tuesday night was not an easy one. When my sister texted me that Debbie Reynolds had died, I felt strangely numb. Of course I was deeply saddened, but the news didn't seem to sink in until five minutes later when I found myself bawling my eyes out. This probably seems weird, maybe even melodramatic, especially for someone who never even met Debbie Reynolds. While it's certainly true that I didn't come face to face with Ms. Reynolds, the open and frank way that she lived her life made her feel like a great friend to me. The woman didn't pull any punches on any subject, and the sheer delight that she took in acting made it clear to audiences that we weren't seeing Debbie Reynolds the Actress, but rather Debbie Reynolds the Person. She never put up a wall between herself and her fans. What you saw was what you got, and what we got was totally and magnificently fabulous. If you asked me to name my top twenty list of the most romantic films I've seen, I could say a few of them right off the bat: Notorious, An Affair to Remember, The Thin Man (seriously! ), Love Letters, Casablanca... and Brigadoon. I have a feeling most of you would disagree with me on that last one. 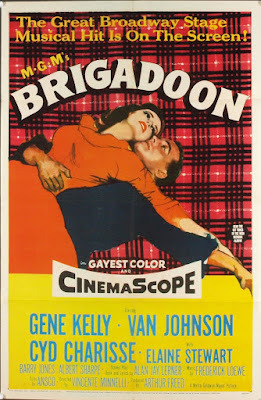 Poor Brigadoon is used to it -- the film has been battered around ever since it was first released in 1954. Actually, Brigadoon's troubles began from the very start of production.